Here's what people are saying about Steel Tile! Thank you for your inquiry in Steel Tile Co. metal roofing products. We look forward to advising you through the purchase of your last roof. Our team knows that this is a big purchase for you and it can be overwhelming at times. We are here to make sure that you get it just right. There are a few pieces of information we will require from you, to determine how we can help you complete your last roofing project. Please remember, all quoting services are provided free of charge. You might even be surprised how affordable a Steel Tile roof truly is. Firstly, we would like to know whether you plan to install the roof yourself, or have a contractor complete the installation for you. Knowing the answer to this question will help us advise you on your next steps. You should choose which profile you are interested in at this time also, as each profile requires different estimating techniques, which means changing profiles could significantly affect your quote. Please follow the instructions below, based on your answer to the previous question. 1) Please call Steel Tile Co. at 1-800-461-5567 or visit our dealer locator and type in your Postal Code to find contractors nearest to your project. i. Arrange for the contractor to visit your home to perform a site measurement. ii. The contractor will determine the material requirements and provide you an estimate for a supply and installation package. This estimate will be based of the profile chosen, amount of material required and the complexity of the job. It is typical for a contractor to provide an estimate on the day of the measure. ii. The contractor will provide a rough estimate based on the roof plans. iii.When you have agreed to hire your contractor, the contractor will perform a site measure, confirm material requirements and provide a final price on the supply and installation of your Steel Tile Roof. 3) Once your have confirmed with your contractor that you will proceed, you will choose a time to install your new roof and they will complete the project. 1) The first thing you will need to do is complete a bird’s eye view drawing of your roof. Our team requests that this diagram is completed with measurements on all straight lines on the roof. In order to complete a quote, we will need the following measurements and pieces of information (preferably in feet and inches format). Please refer to the Appendix later in this document for examples. The position of all pipes and roof venting. Will this product be installed on top of shingles or onto strapping? If on shingles, how many layers? What is the pitch of the roof? Please specify for all sections if the pitch varies. 2) Once a drawing, complete with all measurements, has been submitted to the Steel Tile Team, we will send you a quote for a bill of materials. This quote will outline the required materials to complete the project. 3) When you have decided to proceed, please contact Steel Tile via email or phone and be sure to mention your quote #. Steel Tile will produce the required materials and notify you when the materials are ready to be picked up or will be shipped. Thank you for purchasing your last roof with Steel Tile Co.! Remember to check out our website under the resources tab to access our installation manuals and videos on how to install our product. When picking up your roof, please ensure that your vehicle and trailer has the capacity to handle your load. It is a common occurrence to underestimate the size of the roofing materials. We do not load materials into or onto vehicles in which the team at Steel Tile Co. deems to be unsafe. Below you will find pictures of some common roof types. 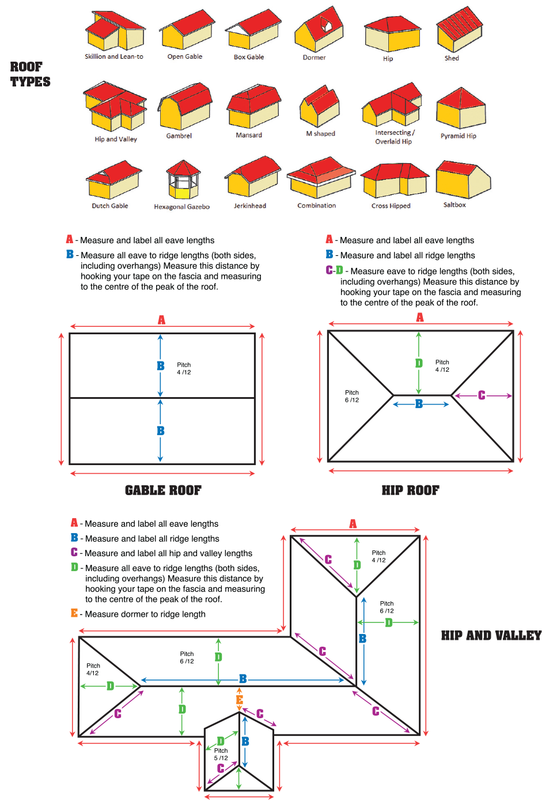 Determine your roof type and provide an aerial drawing with all required measurements. Please see below for some examples of what your drawing should look like.